Precision Movement's KT discusses the injuries and inspiring rehabilitation of three top tennis stars as the US Open Tennis tournament 2016 gets underway. Precision Movement's KT explains how to use Contrast Therapy as part of a comprehensive injury rehabilitation plan. KT from Precision Movement explains how cryotherapy, or cold treatments can help injury recovery. KT from Precision Movement explains the difference between Physiotherapy, Osteopathy and Chiropractic treatment. Is this the best hotel gym space in London? 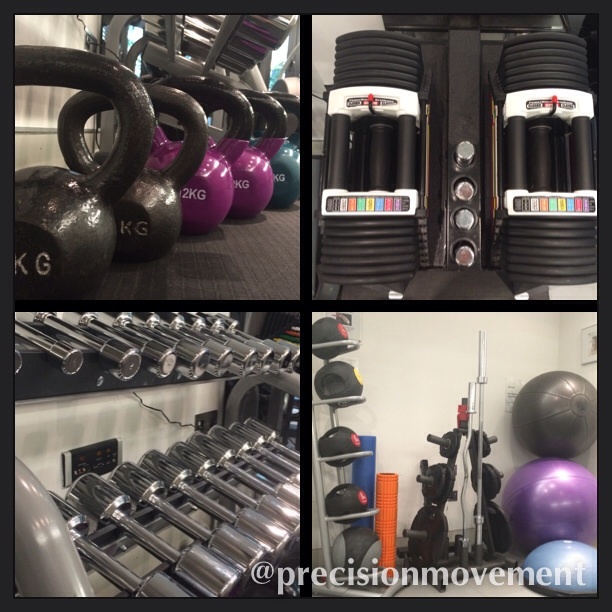 As many of your know Precision Movement has been making extensive additions and changes to our little Mayfair studio space courtesy of Grosvenor House Apartments. And though she be little she is (mighty) fierce and versatile. Here are the new changes to the space and how they optimise your workout. This March we had a custom designed BeaverFit rig installed into the ceiling. This has been the most anticipated change in the studio since we moved in. The rig will be used for pullup/chin up and brachiation training. Also check out the fat GRIPZ for extra intensity without extra load. It has proved super popular so far! 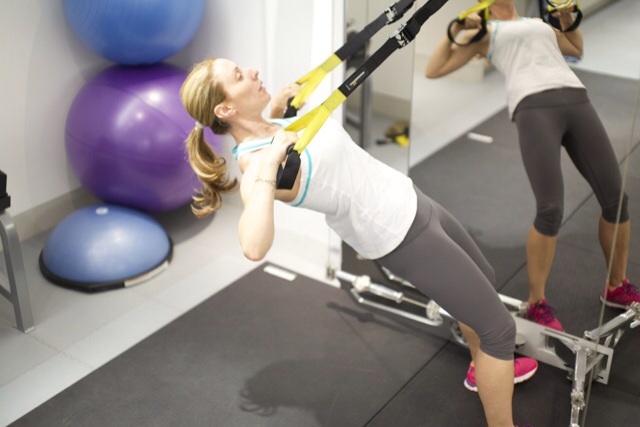 The rig also enables us to use TRx, Crosscore180 and Olympic Rings for suspension and aerial training. Bring on the strength! The rig is 3.5m long meaning we can have someone working on the Kinesis, someone working on the TRx and someone in the weight area quite comfortably. The matted floorspace has been increased by a third meaning more workable space for people to use and more people using the space at the same time. It also means the floorspace becomes more versatile - we can bring out a barre for a ballet workout or clear the space for kickboxing or a yoga based work-in. We have had some guests using the space to practice their karate katas and MMA moves. We have left the space open for just this purpose because no single person's workout is the same and we want to cater to that as much as possible. We now have adjustable weights up to 41kg each alongside the original rack of 1-10kg. We have a few olympic bars and weight plates for more traditional strength training as well as weighted medicine balls and powerbags. The original Kinesis cable machine is still installed as well. We have lots of different equipment that can be used in the space - kettlebells, powerbags, battling ropes, agility equipment, olympic bars, medicine balls. We bring out what we need into the space for your specific workout and then put it back to open the space up again. It sounds really obvious but many gyms, particularly hotel and residence gyms are the same space as our little studio but packed full of machines which limits the type of exercise you can do in the space. Training has moved on past machines... there are some uses for machine work but at Precision Movement we are more steered towards challenging your body in different ways. Which is why we think our space is becoming one of the best hotel gyms in London. The space is being used more than it ever has been and it's being used in many ways, for all kinds of movement, workouts and sports conditioning. If you haven't been down to visit yet, then please do. We'd love to have you! 6. Get in the car and go 1-2 hours outside London for a day trip. There is brilliant hiking in the South Downs, a cliff top walk in Dover, a city stroll in Cambridge, a country walk in the cotswolds. If you time it right you can do a day trip. Check out BuzzFeed's recommendations. KT: Let's start with the basics... Did you play cricket when you were young? TC: I always say that I was pre-destined to enjoy cricket due to my half-Indian, half- Sri Lankan heritage. Add to that being born in England and raised in Australia, cricket is the game which binds these nations together. Sadly, despite this genetic and cultural mix and many hours in our suburban backyard playing cricket with my brother, the cricket genius never materialised. When I did play social cricket games with friends as a teenager I was always the designated non-batting, non-bowling, outfielder… and I can’t catch. I did (and still do) enjoy watching cricket which actually led me towards a career in physio. I was about 14 years old and watching a Test match. The Australian captain, Allan Border went down with a back injury while batting. The Aussie physio trotted out and manipulated his back on the pitch and Border went on to make a hundred. I was amazed and thought, if I could never make a hundred for Australia, maybe I could be the guy who keeps the players who can do it on the park. At the time I didn’t know what a physio was, but I knew I wanted to be one. KT: How long have you been working with Hampshire Cricket? TC: I moved to Hampshire County Cricket for the 2013 season so have been here for just on 18 months. Prior to this I was physio for the Victorian Cricket Team from 2009 and have worked in sports physio my whole career. KT: What are the common injuries that cricket players often get? TC: Cricket is an unusual sport in that fast bowlers are the guys who get about 70% of all injuries, particularly those injuries that stop them being able to play. Most commonly these are lower limb overuse problems such as knee and ankle tendinopathies, cartilage injuries to the hip, knee and ankle as well as bone stress lesions, especially in the lower back. They are also susceptible to the usual lower limb soft tissue strains seen in other high intensity running sports. Batsmen get injured too, but these tend to be on the less severe end of the spectrum. That is, except for fractures caused by getting hit by the ball, which mainly occur to the hands and upper limb. KT: Why are these particular injuries so common? TC: For bowlers some of the most debilitating and common injuries are lumbar or lower back stress lesions. Typically seen in adolescent and young adult fast bowlers, pain onset is usually gradual with worsening symptoms on continued bowling. It is a complex pathology related to a multitude of co-factors including; growth stage and rate, bowling workload, bowling action mechanics, muscular strength and many others. It is so common that every international fast bowler will have been through at least one bout of rehab for lumbar stress reactions or fractures and many will have had multiple episodes. The primary cause is due to the high compressive and shear forces which the lumbar spine needs to absorb and transmit during the fast bowling action. In fact some studies show ground reaction forces at front foot contact to be 8 times body weight. Fast bowlers can do this 120 times per day! A lot of the current research is looking at ways to better manage fast bowlers to minimize their risks of these injuries developing. KT: How long does it take for a cricket player to get back on the field after an injury? TC: Like any injury, return to play is dependent on the severity and nature of the pathology. Low grade stress reactions with early detection can be back playing within 3-4 months while full stress factures may mean missing up to 12 months of bowling and may even need surgery if the stability of the spine is compromised and pain persists. TC: As a sport physio I have a big box of tools that I can use to help make this recovery process as efficient and effective as possible. These start with assessment tools and investigations to evaluate and objectify the problem. This allows me to then judiciously use specific treatments including manual therapy and dry needling for pain management and to improve particular movements and/or tissue quality. However the crux of any rehab plan is a progressive motor control, movement patterning and strengthening programme with clear objective goals and steps to allow continuous progression and return the athlete to bowling. This often includes corrective exercise at the start of an injury rehabilitation programme. KT: How does physio for an elite sportsman compare to physio treatment for non-sports people? TC: The biggest difference, is that a professional athlete’s body is their tool for their livelihood. So as a physio, my job is not to rule them out of playing whenever they have a niggle. Nor is it to work my magic on them and get them fit to play whenever they need it. My job is to make sure they never miss a training session, and never miss a game. The cricketers who achieve this, end up being better athletes because they get to practice their skills more then the guy who is injured all the time. And not surprisingly, the more you are able to practice, the longer and more successful your career in the sport. This process is not dissimilar for non-sports people but the expectations on outcome and commitment to recovery are different. With elite athletes I am also lucky in having the opportunity to try to prevent injuries from happening in the first place. I do this through education and injury prevention programming. Using musculoskeletal screening assessments, I individualise their programs which becomes part of their routine. I feel this empowers the players to be more independent with their body management and gives them better awareness and understanding of their bodies to use them more effectively. KT: Who are you backing for the Cricket World Cup? KT: Who do you think will win? TC: My tip is actually New Zealand, they have a great group of batters and bowlers, will play the conditions well and seem to be a winning team at the moment. KT: Who is your favourite cricket player across all the teams worldwide and why? TC: My favourite is the captain of Sri Lanka, Angelo Matthews as he is always so passionate about winning and never gives his wicket up easily.